The app is exactly what you'd expect from a task management tool, allowing you to keep track of projects, assign responsibilities, share files, and chat with the rest of the team or class about what needs to be done. 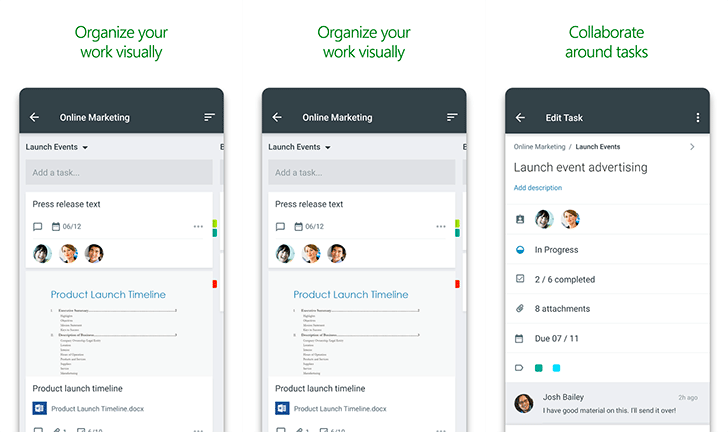 Office 365 users will be familiar with the UI as it follows a similar pattern to the others in the suite, and there are some really nice visual representations of workflows and progress. With compatibility across multiple devices and operating systems, you can easily keep track of your plans wherever you go. Right now, it's not possible to create new plans from scratch on the app, but Microsoft promises that will come with a future update. The same applies to push notifications and integration with Microsoft's device management platform, Intune. Office 365 subscribers can download the app via the Play Store link below, subject to location. Anyone else can grab it manually from APKMirror. At present, Planner is not compatible with personal Office 365 accounts.